On April 21, 2017 the J.E.T. 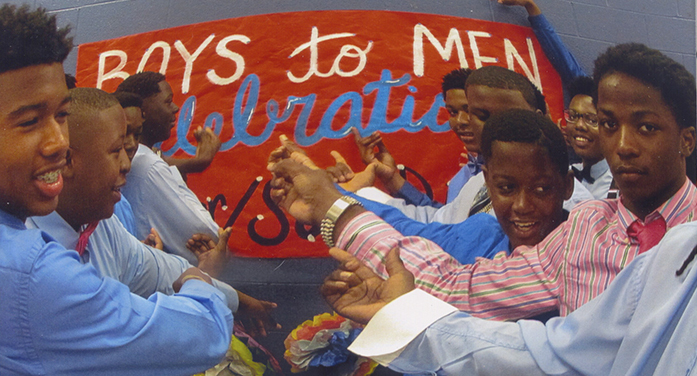 Boys-to-Men Mentoring Club held its 5th mother/son celebration dinner. The butterflies, bees, flowers and pastel color décor displayed an elegantly summertime-fun atmosphere, with just a hint of evening design. Mothers looked like queen bees getting ready to receive their crowns. They were all dressed in their glitter and chiffon with twinkles in theirs eyes as their sons took their places. J.E.T. members of the boys club stood tall and handsome with their heads high like the eagles they are. Our bold and versatile speaker who gave tribute to the boys club members was none other than Rev. Dr. Willie Campbell, ECSB member. He was in his all-time boldness, illustrating the point of being an “eagle and not a pigeon.” His words inspired the entire the crowd that resulted in a standing ovation. Graciousness to Rev. Dr. Campbell for a job outstandingly done. Mrs. Ruth H. Mack greeted all guests, especially the mothers, and thanked everyone for their presence. Keontrez Harris introduced the Master of Ceremony, Malachi Sewell; Welcome by Wade Brannon; Occasion Darious Rouse; History of J.E.T. Boys-To-Men Club, Brandon Williams; Poems by Logan Johnson, Nathan Daws, and Danarious Strom. They were outstanding and their mothers were so proud. You can tell this by the smiles on moms’ faces and tears in their eyes. Marcus Moore, Asst. Principal at Burke Co. High School, recognized the 1st J.E.T. boys club members who were enrolled in the first initiative. Representing that group was Mr. Josh Moore, a leader in his own right. He and the other boys will graduate in June 2017. What can we say about the spirit-filled solo by Thaddeus Burton, followed by the blessing of the food by Rev. Oscar W. Brown, pastor of Pleasant Grove Baptist Church in Edgefield. Trophies were given to the “Crew” where mere words would not do. They started out with this club and help put it together, and stayed with the boys and Mrs. Mack the entire time. The trophies read “Best of the Best,” 2012 to 2017. The trophies were presented to Mr. Oscar Stevens, Mrs. Marjorie Bibbs, Mr. Nathaniel Haynes, Mrs. Laurie Prince, Mrs. Cecilia Bryant, Mrs. Bernita Kinard, and Mr. Douglas Mack. Mrs. Mack also recognized the Mentors that kept this boys club together five (5) straight years of the good and the bad. They stayed the course regardless of what hurdles were thrown at them. They were still loving, caring, and shaping lives of the young men. These mentors were Wendy Jacobs, Coach Victor Love, and Deputy Archie Hill. They were given plaques that read, “In Recognition of Your Loyal and Faithful Support 2012-2017.” Mrs. Courtney, Principal J.E.T Middle School, was recognized for support and belief in the program to see it to the end. Mrs. Ruth H. Mack, the visionary, was also recognized for her strong will and determination to foresee a very well needed program in our school. Mrs. Mack’s determination led her to her principal at the time, Mr. Stephen Hampton. She was thanked for her love, guidance, and courage to plan this boys club so someone could water it and help it continue to grow. A job well-done!! As the evening began to fall, one more star had to shine for the good. An unsolicited and genuine presentation was given to Rev. Dr. Willie Campbell for his forever caring, and genuineness, for these young men over the years, their mothers, and mankind everywhere.